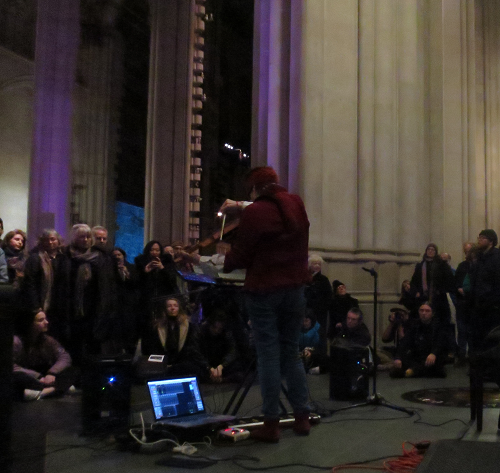 Lou Reed Drones at the Cathedral of St. John the Divine. The description really undersells it - there was a lot going on. Dance pieces, performers in various locations throughout the space, people lying down on the floor, so, so, so much recording (I saw someone with a HandyZoom). 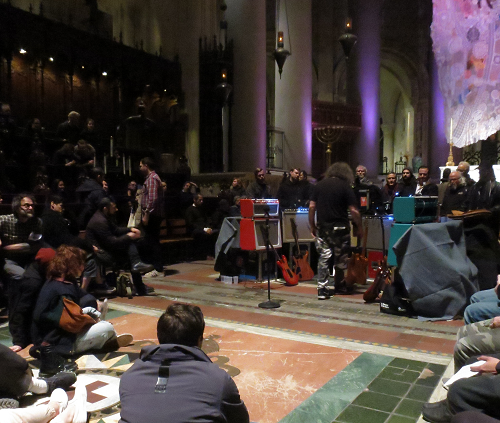 The droning, which was hypnotic and ominous and lovely, was confined to one area up by the altar, and I'm sure the person handling it would have been instantly recognizable to people more knowledgeable than me. My famous-musician spotting was limited to "oh, there's Laurie Anderson." And I know pictures of music are stupid, but here are two pictures of music. I really wanted to go to that. The closest thing I saw to an organist was someone playing an electronic keyboard. Maybe I left too early (around 8:30). I am absolutely sick my newsletter missed that. I was already disappointed when Massive Attack canceled this weekend's shows. But now they've rescheduled them for the nigh I am going to see Stereolab. ktl w/dreamcrusher. the two people in ktl took turns playing alone for about a third of the performance and peter rehberg blew o’malley off the stage, but I found the set as a whole boring, which was surprising given my memory of their records. I’ll dig those out tomorrow to see what changed. Grumpy guy here skipped invitations to Flo-Rida and The Killers, but I think I should go see Lady Gaga.